A Doberman pinscher puppy named Bo nearly drowned in the family pool, then his heart stopped upon arrival at the University of Florida’s pet emergency clinic in Ocala. But after CPR administered by UF veterinary medical specialists, additional treatment at the university’s Small Animal Hospital in Gainesville and a dose of good luck, Bo survived to return home in early November. A little over a week later7-month-old Bo was fully recovered and graduated as top dog in his puppy obedience class. Ashley Allen, D.V.M., a clinical assistant professor of emergency and critical care medicine, was on duty in Ocala when Bo’s family brought him in on Nov. 4. She said that in addition to veterinary expertise, the availability of a transport ventilator used to take him from the smaller pet emergency clinic in Ocala to the UF Small Animal Hospital in Gainesville helped to save his life. His owners said they will never forget the day Bo’s ordeal started. “That morning, I let our dogs outside,” said Bo’s owner, Tania Travieso, of Ocala. “After about five minutes, I asked my son to let the dogs back in. My son noticed that Bo and another one of our dogs were in the pool and that Bo was in distress and underwater.”Travieso’s son jumped in and pulled Bo out of the pool. Family members wrapped him in a comforter and placed him on a bed. They saw the puppy was conscious but coughing and that blood had begun seeping out of his mouth. “His gums were gray and we knew he was in major distress,” Travieso said. The family drove Bo to the UF Pet Emergency Treatment Services clinic in Ocala, hoping for the best. 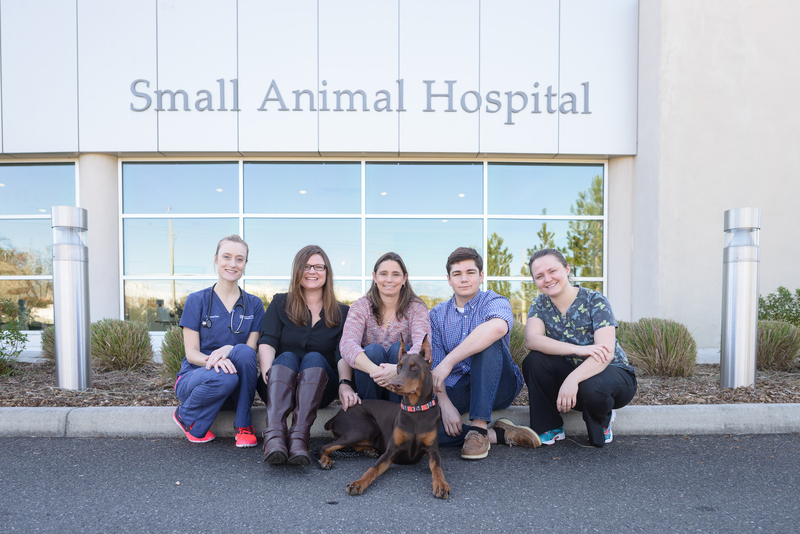 However, soon after they arrived and handed Bo to the staff, UF veterinary emergency doctors told them Bo’s heart had stopped. Allen explained that most puppies suffering from noncardiogenic pulmonary edema have a good prognosis for recovery. Unfortunately, Bo had been resuscitated, which can lead to severe secondary issues such as kidney failure, neurological signs and abnormal heart rhythms. The primary issue of fluid in his lungs and secondary issues from CPR meant there were significant uncertainties about both Bo’s short- and long-term prognoses. After the family consented, Allen and her team, including veterinary technicians Ryan Coy and Jennifer Lopez, along with third-year veterinary student Alicia Welsh, prepared Bo for the drive to Gainesville by sedating him and placing him on a transport ventilator. Twice before their arrival, they had to pull over to deal with medical issues Bo was having. By the time they approached the hospital’s entrance, Bo’s lungs had again filled up with fluid. Bo was close to death, Allen said. Bo was not yet out of the woods, but he gradually improved. Three days later, on Nov. 7, the family was finally able to take him home. He made a full recovery with no expected long-term effects. Less than 6 percent of dogs and cats that experience cardiopulmonary arrest in the hospital survive to be discharged, according to several studies published in the Journal of Veterinary Emergency and Critical Care. She had nothing but positive things to say about the UF veterinarians who saved Bo.